RIO HONDO — Being sliced in half for the past 20 months was a daily inconvenience that complicated life for individuals, businesses and local government officials alike. Residents on the west side of the city have been required to make a long commute to make it downtown. And those who were downtown had an equally long detour to reach homes and friends across the Arroyo Colorado. But by the end of this month, or early the next, the rehabbed and refitted mechanical lift bridge on FM 106 will re-open to vehicular traffic once again. And that, officials and residents here say, is reason enough to throw a party. Rio Hondo Bridgefest is scheduled for April 28, whether the bridge is open or not, officials say. 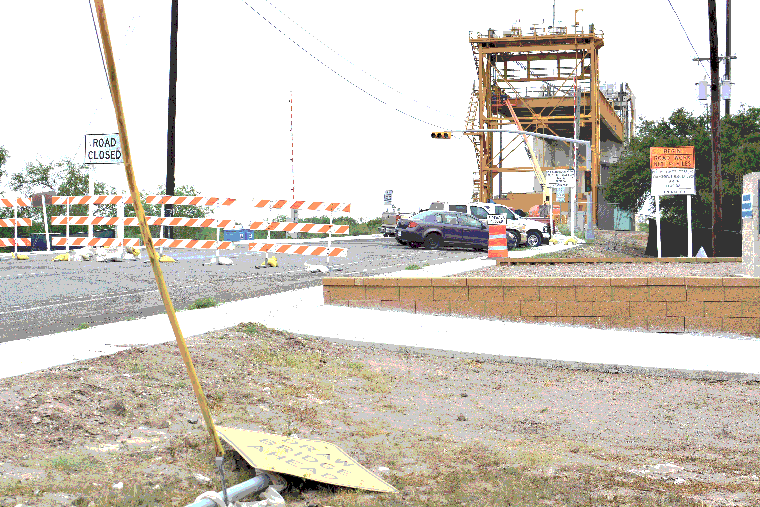 “We knew it was going to happen, that our bridge was going to be rehabbed, but it should be open pretty soon,” Rio Hondo Mayor Gus Olivares said yesterday. “We just want to celebrate and feed our community, have some entertainment, have a parade and maybe some fireworks at the end of the night. The mechanical lift bridge is one of just a few such structures like it still operating in the United States. The $12.4 million retrofit should be finished well within the TxDOT time estimate for completing the project. The bridge is required to lift for barge traffic which pushes up and down the Arroyo Colorado to reach the Port of Harlingen dock facilities. The newly painted, school bus-yellow bridge isn’t the only thing downtown Rio Hondo will be showing off. A $350,000 TxDOT grant and about $50,000 from the city were combined to construct new sidewalks and new landscaping in the city’s downtown area. Olivares also said, while less visible than the bridge and sidewalks, the city is putting in new water meters and has been rehabbing its water plant as well. Many local businesses struggled with the bridge’s shutdown, but others in this city of about 2,500 people managed to prosper. “I think it will be great to have the bridge open again, especially for the people on the west side of the bridge,” said Patti McMillen, park manager at Twin Palms R.V. Resort downtown. JC Vallade is the owner of The Professional Shutter Co. which has been in Rio Hondo for 12 years and specializes in hurricane shutters. “Oh, without a doubt, Rio Hondo felt it, but me I advertise a lot outside so it hasn’t affected me,” he said. The good news is the rehabilitation of the mechanical lift bridge is almost complete. The 382-foot span opened in 1953 and, with any luck, it will be decades before another extensive refit is required. “What we really want to do is to have the community, and people from surrounding communities, come to Rio Hondo and see what Rio Hondo is becoming, all the changes that have happened,” Olivares said. Contractor: PCL Civil Contractors Inc. The project consists of a complete overhaul of the mechanical lift bridge over the Arroyo Colorado. Traffic should begin crossing by late April or early May.